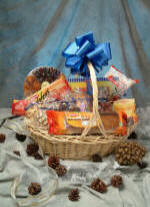 A Perfect gift basket for the celebration of Jewish festival. Box of assorted dried fruits choc. orange peel box choc. wafers Elite choc. bar, raw walnut roasted/salted cashews, roasted/salted pistachio, roasted almonds bag of marshmallows, Meshuga nuts Medjul date, box of fruit slices big Osem Cake roasted/salted macadamia nut roasted filbert and papaya. roasted/ salted cashew , roasted/salted pistachios, roasted almonds, bag of marshmallows Meshuga nuts, Medjul dates box of fruit slices small Osem Cake, choc. wafers.